Swimmer Ryan Lochte poses for a photo with his gold medal on the Today-show set on Copacabana Beach in Rio de Janeiro on Aug. 12, 2016. We’d like to welcome you to the annual Wypipo Awards. For those of you attending for the first time, these awards are not focused on all white people. Instead, this is a ceremony that celebrates the subset of the Caucasian constituency constantly complaining that the BET Awards, the NAACP Awards and even the Soul Train Awards are inherently racist because they are limited to black people. And these white people do so even when we futilely explain to them that the previously mentioned accolades exist because of the lack of diversity in mainstream awards shows, so complaining about black awards shows is like wondering why the Girl Scouts won’t let boys sell any cookies. But you know wypipo—they hate being left out. So our founder, Mr. Y.P. Pull—who made his fortune building desalinization plants that take the salt out of white tears and use it to irrigate kale farms—started this awards show to recognize wypipo. Not everyone is eligible for these honors. Only the small subset of white people called “wypipo”—those who trade in privilege, hate and what our panelists call “white people s—t”—are eligible to receive a nomination. Without further ado, here are the nominees and winners of the 2016 Wypipo Awards. All wypipo: For their outrage over the Harriet Tubman $10 bill. And the winner is: Abigail Fisher. Abigail Noel Fisher speaks to the media Oct. 10, 2012, in Washington, D.C., after the Supreme Court heard arguments in her affirmative action case against the University of Texas. No one exemplifies white tears more than the woman with mediocre grades and below-average test scores, so blinded by her entitled privilege that she took the University of Texas System all the way to the Supreme Court. When the highest court in the country heard her legal argument that minorities benefiting from affirmative action took her spot, they took one look at her transcripts and suggested that she use them to dry her eyes and enroll in a community college. We salute you, Ms. Fisher, and offer you this goal trophy to collect your tears. Iggy Azalea: For being Iggy Azalea. And the winner is: The mourners who said that Muhammad Ali transcended race. You should keep your hands in your pockets around wypipo because they will take whatever you have: your land, your music, your art and—if you aren’t careful—your icons. The people who castigated Ali for his unflinchingly heroic stance on the Vietnam War pounced on his legacy to turn him into a universal “American” hero as soon as he gave up the ghost. Maybe we would’ve known if you hadn’t killed him. Nice try. Here’s a plaque for your efforts. Lena Dunham: For her white-woman-privilege Twitter rant against Odell Beckham Jr.
Wendy Bell: For breaking her arm patting herself on the back for noticing a black busboy. And the winner is: Taylor Swift. Taylor Swift performs during iHeartRadio Jingle Ball 2014, hosted by Z100 New York and presented by Goldfish Puffs, at Madison Square Garden in New York City on Dec. 12, 2014. Taylor Swift, the woe-is-me singer of white-angst ballads and serial under-the-bus thrower, was caught in a spider web of lies and exposed by another nominee, Kim Kardashian. The poster girl for the frailty of white femininity constantly played the strong but victimized martyr of Kanye’s antics, until Mrs. Yeezy brought receipts and toppled the house of white lies sheltering Swift. Maybe this award can keep her warm. And the winner is: Secret white emailers. Until 2016, no one had any idea that there was a secret white email network across America (thank you, Issa Rae). Then we found out that cops, city officials, politicians and regular people have been sending correspondence laced with racist Obama cartoons and anti-black jokes right under our noses. Soon after, the Democratic National Committee was hacked and we found out it was subverting the will of its constituents (thanks, Russia). Not to mention Hillary Clinton’s email scandal that might have cost her the election. There are wypipo who are more upset that the FBI didn’t charge Clinton than they are at the jury who didn’t convict former North Charleston, S.C., Police Officer Michael Slager for murdering Walter Scott. They should take this award and put it in the basement beside their email server. Fox News: Do we even need to explain? 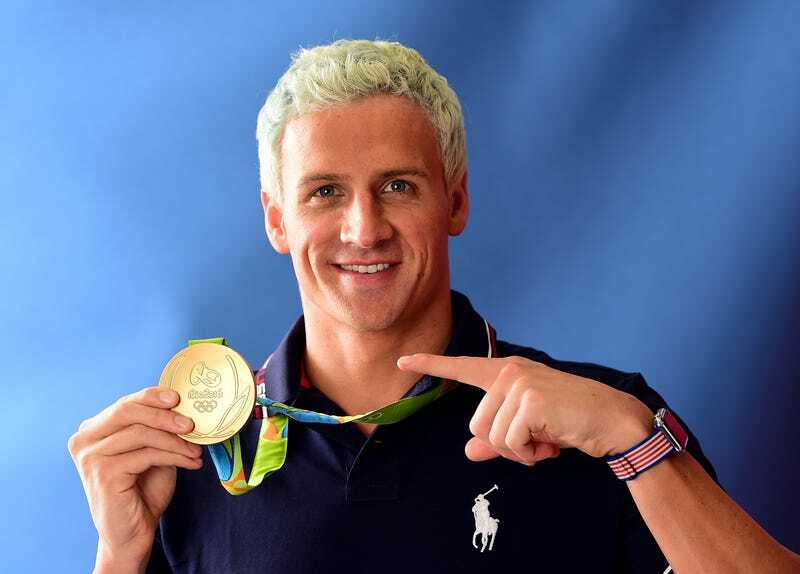 And the winner is: Ryan Lochte. If you ever need the vast and disparate history of wypipo consolidated and personified, look no further than the story of Lochte at the 2016 Olympics. Simply put, it is the story of a fair-haired, entitled white man who crossed the sea to a land of brown people, pissed all over their land, then convinced the world that the brown people were violent savages and he was the brave hero. Then he left with the gold. Aren’t you glad we melted it down to make this trophy? Donald Trump: For being troll of the year. And the winner is: Donald Trump. This was one of the closest votes ever. Every nominee in this category was a white troll, and no one has ever done it better than Trump. If you told me two years ago that our next president would be the former host of The Apprentice, I would’ve asked you where you bought your crystal meth and what made you decide to mix it with crack before you smoked it. But here we are. Just like Jeb Bush after every Republican debate—we gon’ cry in the car. But we’ll have this prize to make us feel better. We haven’t looked up the 2016 police-brutality numbers, partly because it is specifically forbidden by Congress, but this was one of rogue cops’ most productive years. The statistics don’t tell the true story of 2016’s hostile antagonism. Sure, there were the usual Alton Sterling video murders of unarmed black men, but that doesn’t begin to tell the story of the achievements of police brutality. We got to see Terence Crutcher slaughtered on live, local TV, and Philando Castile’s lynching was streamed on Facebook. Laquan McDonald’s death was recorded almost two years ago, but we didn’t see it until 2016. Walter Scott may not have been murdered in 2016, but a jury wouldn’t convict his murderer this year. Ditto for Sam Dubose. But this is a Lifetime Achievement Award, and the officers who commit police brutality share this award with the brutal wypipo who came before them. This award is not just for the police, who have killed 912 people since Jan. 1. This is for the plantation supervisors. This is for the fugitive slave hunters. This is for the German shepherds turned on civil rights marchers. This is for COINTELPRO. This is for neighborhood watchmen chasing hooded teenagers. This is for wypipo. Congratulations to you all. See you again next year.